Driving to the ferry terminal in Belfast. Parking up the car for our return. Boarding the ferry as foot passengers. After arriving in Cairnryan, hopping in a taxi to take us to Stranraer. Getting a train from Stranraer to Ayr. Getting picked up at Ayr train station by the sellers of the motorhome. The plan was to pick up the motorhome and drive it back to the ferry in Cairnryan. Board the ferry to Belfast where I was to pick up the car and follow Alan home. Sounds simple, doesn’t it….. Arriving in Cumnock and seeing “The Van” for the first time was quite a moment – nothing prepared either of us for the actual size of this thing. It was HUGE – I suddenly thought – Alan’s never driven anything bigger than a sprinter van, how are we going to get this fecking thing home. An hour and a very quick driving lesson later, we were on the road back to Cairnryan. The drive back was “an experience”. There were a few shouts of “KERB” from me as Alan’s sense of space was challenged. Those tight winding roads on the way to Cairnryan were filled with lorries heading at some considerable speed towards the ferry terminal. I have a new-found respect for the drivers of those 40 foot articulated monsters who have no doubt of the size of the space their vehicle will fit into. We, on the other hand, drove more cautiously, convinced that unless we had a clear 8 feet around the van, we were bound to hit something. Quick driving lesson, why does he look so relaxed? Along the way we decided to stop at a petrol station to get drinks and snacks – Alan indicates and pulls into the forecourt completely forgetting that we’re not in our usual Citroen Picasso and that getting this beast into a space is a whole lot easier than getting it out. Cue Alan’s first three-point turn in a confined space. For a brief 10 minute period we became the local entertainment as the place came to a standstill – everyone waiting to see what we would hit first. As usual Alan did us proud and managed to make a 4 or 5 point turn and get us back on the road. We reached Cairnryan in good time and joined the queue to board, we even had time for a cup of tea! We boarded the ferry with little or no incident and settled down for the crossing. Having parked our car at the Belfast terminal that morning we decided that it might be better if I disembarked as a foot passenger so that Alan didn’t have to navigate the van round the car parks to retrieve the car. When the announcement was made for drivers to return to their vehicles – off Alan went with a “see you later”. There I am sitting waiting patiently for the ferry door to open. I noticed a distinct lack of other foot passengers and was just starting question whether I might be the only person on foot, when a man perched atop a mobile floor polisher drove past me – we nodded and smiled, I sat on. Panic rising, I explained as quickly as I could our clever plan for retrieving our car in Belfast without having to navigate a 30 foot motorhome around the tight car park. He indicated that I needed to shift my arse tout suite to the car deck and find the vehicle I boarded on. Now anyone who knows me knows that I am not given to a lot of sudden movement but needs must – off I took down seven, yes that’s SEVEN flights of stairs at some considerable speed out through the door and slap bang straight into the side of a 40 foot articulated lorry. I opened the door and jumped – more sudden movement – arthritic hip be dammed – into the cab just as we were given the signal to drive off. Much hysterical laughter followed (from me) greeted with Alan’s usual WTF are you doing now look. We managed to navigate the van towards the now closed car park. We could see our car in the distance but no way to get to it so Alan decided to drive around the narrow roadway to the terminal building designed for cars to drop off passengers – forgetting that our Picasso is as best 10 feet long and the van is just under 30 feet! Halfway through, on a slight bend we heard the distinct sound of metal on metal. Alan drove on determined that the van would in fact go through the gap one way or another – I suggested he might like to stop and take a look. Climbing cautiously down from the cab I made my way around to the drivers side of the van to discover that half of the 30 foot rubber “side bumper” had been sheared right off by a metal fence. Deciding it would take more effort to push it back on than to pull it right off I grabbed the end of it and tugged and tugged until I was left with a 30 foot long piece of industrial rubber tucked under my arm. Alan adopted his usual supervisory position in the cab while I wrestled the bumper in through the side door praying it wouldn’t cost an arm and a leg to fix back on. I settled myself back into the cab and indicated that we could proceed. As we approached our car a security truck drove alongside with a clearly confused security guard asking WTF we thought we were doing. I can only imagine his horror watching our antics round his car park on the monitor in his nice warm office – we explained our dilemma and thankfully he was happy to lead us to the exit and even happier to see the back of us. We had previously discussed how we would negotiate the van into our driveway, deciding that our neighbours would be much more excited to see our new acquisition in all its glory first thing in the morning, rather than hear us trying to maneouvre a 30 foot van into a 31 ft driveway at 3.15am. So we abandoned the van across two spaces in the large car park at Carrickfergus Castle, which is near where we live. I phoned the police to let them know our plans and was disappointed at the lack of interest they expressed in our new purchase! Basically I could leave it wherever I liked as long as it was taxed and insured – don’t fecking tempt me! We had a restorative cup of tea, contemplated recent events and retired to bed exhausted. Hi Alan & Michelle, decided to look you up after your welcome comments on our blog. That’s some outfit you have there, and while I am one of those 40ft truck drivers I had never considered a truck style motorhome. I would be very interested to know your immediate thoughts on advantages/disadvantages of a unit that size and will it influence your travel plans. Not worked out how long you have motorhomed yet but the blog and truck look like ‘this year’ events so will enjoy following your journey. 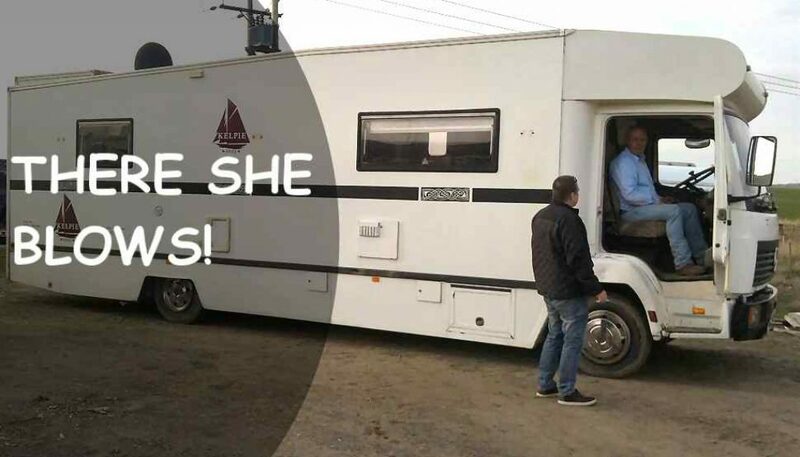 Hi Steve & Deb – The honest truth is that we have never motorhomed before in our lives! Also, until I bought this motorhome, I had never driven anything larger than a long wheel base transit van! So everyone may wonder why we bought something so large. The first reason was a good separate bed. We have a 5′ wide king sized bed in the bedroom. We felt this was important for a couple of reasons. If you are living full time in the motorhome there is nothing worse than a small or uncomfortable bed for a good night’s rest. We were able to bring our own bed mattress that we were used to at home and this had led to comfortable sleeps. We also tend to go to bed at different times. I normally sit up late, so we wanted the bedroom area to be separate from the living area. Also, if one of us wants a kip during the day (which we sometimes need as we both suffer from depression at times), it is easy without re-arranging the whole motorhome and kicking the other person outside to avoid being disturbed :-). I also like the idea that the cab is totally separate. If I have been driving for a long time, it is nice to kick back in the living area and not just swivel your driving seat around to make it part of the lounge – although I can see the space saving reason for this. Obviously size can be an issue as you will know and certain roads are out of bounds. It is important to have a lorry satnav to keep you right. I have a couple of battle scars from tight turns in French villages, but apart from this I have managed OK since we set off at the start of December and have managed to get the motorhome into some tight pitches without too much difficulty. Even this evening we arrived at a site as it was turning dark and saw a sign at the entrance for a maximum length of 8m. We are 9m long! The site owner was great, picked us out a pitch and guided us in watching both our wheels and the overhanging tree branches and it was straight in in one go. I have never had any training in these vehicles and drive it on grandfather rights ;-). The motorhome is rated 7.5 tonne which allows a greater payload. This is especially helpful in that we have a huge water tank and waste tank that can last us for days on end. And the most important factor for Michelle is that it has a large kitchen with separate island. Some motorhomes have no worktop space at all for meal preparation. Finally we have the larger engine. Being an older Mercedes it has what was called the “million mile engine” straight six cylinder 6l engine. No turbo which is a pain on hills, but also no electronics and easy to keep serviced. Some of the van based chassis are clearly under-powered and the engines suffer as a result. The engines were designed for vans which are empty half the time but they are pulling a motorhome right on its weight limit permanently. To be honest, our only disappointment with this motorhome is that the garage/boot space is not a great size for bikes or bulkier items, and most of the truck based motorhomes have the bed higher inside with all the garage space under the bed. I am already thinking that my next motorhome may well be a truck based motorhome as the positives outweigh the negatives IMHO – as long as you are not looking a vehicle that can nip down sandy tracks on to a beach to do a bit of surfing! Finally, they do depreciate in value more which means you can pick up some luxury units for the price of an ordinary 3.5 tonne vehicle – or like us if you are cost conscious, you can pick up some absolute bargain basement units that need a bit of TLC. Just make sure any that you look at are dry inside with no leaks and you will be fine. We set off on our journey at the start of December, so have some writing to do to bring our blog up to date pointing out some of the calamities along the way – so stay tuned and you will see some of the tight spots we have managed to park up!